After breaking down Jurassic Park's The InGen affair earlier this week, I will now analyze The raptor bite, the second chapter in Michael Crichton's book, and compare it to the events in the JP movies. In synopsis: We find ourselves in Bahía Anasco, a fisherman's village on the West Coast of Costa Rica. On a rainy night, a severely injured InGen Construction worker is brought into the local hospital with a Sikorsky helicopter. Carried in by two crew members, who take their orders from a red-haired man named Ed Regis, Chicago-trained doctor on duty Roberta Carter quickly assesses the severity of the worker's peculair flesh wound. With no dirt, but only slithery slime in the wound, she doesn't believe that the accident was caused by a backhoe. The worker whispers "Lo sa raptor ..." (which means 'hupia' in Spanish, according to a hospital staff) and shortly thereafter passes away. Regis and the other men disappear quickly after his death, taking with them the dead body and Carter's camera. Bahía Anasco is said to be situated 20 minutes from San José. The InGen island is 150-200 kilometers removed from the coast. Bahía Anasco is a fictional fisherman's village located on the West Coast. 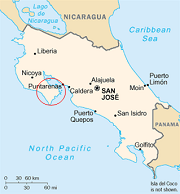 Given that, according to the book, the village is removed 20 minutes through the air from San Jose, I believe it is situated somewhere within the red circle, between 40 and 50 kilometers from the capital. My guesstimation is in accordance with this map I found on JPL Live The Legend. Sikorsky's are American medium-sized commercial utility helicopters. They are pretty conventional, with a four-blade fully articulated main rotor and a four-bladed anti-torque rotor on the port side of the tailboom. It seats two pilots (or a pilot and a passenger) side-by-side in the cockpit, situated ahead of the cabin, which in turn can accomodate a further 12 passengers. Accidents happen all the time on construction sites. Injuries and deaths are caused, among others, when workers fall, are struck by objects, get electrocuted or get caught in/between equipment. The wounds caused by these accidents, however, are very different from wounds from animal attacks. Doctor Bobbie Porter in the book likens the worker's flesh wounds to those caused by a wild dog or a Bengal tiger, with the absence of dirt and typical signs of mechanical crushing strengthening her belief. "Lo sa raptor" translates to "It's a raptor/kidnapper". The hupia are undead spirits from the Taino culture. As spirits of the dead and the night, they were feared and said to seduce women and kidnap people who ventured outside after dark. The Taino were an Arawak people who were indigenous peoples of the Carribean. The InGen island is an island off the West Coast of Costa Rica. It is believed that InGen is a building a lavish resort there with swimming pools and tennis courts. It is removed between 150 and 200 kilometers from the coast. Ed Regis is a red-haired InGen employee. 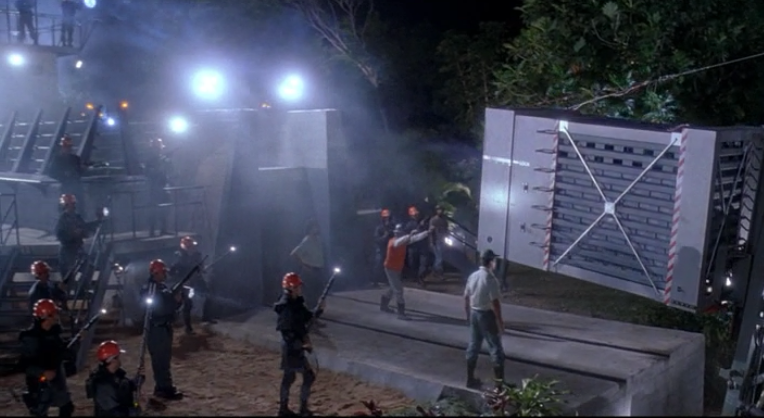 Jurassic Park (1993) - During the terrifying opening scene, a bunch of workers attempt to unload a dangerous animal into a pen. The transport, of course, goes horribly wrong, with the gatekeeper dragged into the cage. Jurassic World III (2001) - Dr. Grant and the Kirby's are evacuated from Isla Sorna with Sikorsky UH-60's. In Jurassic Park (1993), they used an Agusta A109A and a Bell 206L-1 LongRanger II. Jurassic Park (1993) - The only map image of Isla Nublar is shown via satellite imagery in the Jurassic Park Control Room. B' is located 87 miles (140 kilometers) west of Isla Nublar. We also learn from that backlit map that Ian Malcoms daughter Kelly looks at in the trailer that Isla Sorna is part of The Five Deaths island chain (see red circle). The four other islands are Las Cinco Muertes, Isla Matanceros, Isla Muerta, and Isla Pena. Nublar (which should be somewhere in the green circle), however, is not on the map. 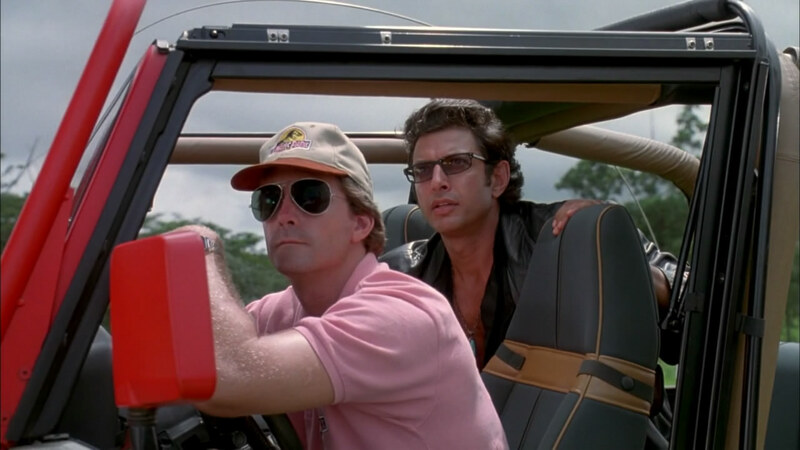 Jurassic Park (1993) - Ed Regis doesn't officially appear in Jurassic Park. It is rumored, however, that he makes a cameo as the red-haired Jeep driver. His hair and baseball cap are similar to Crichton's description of him in the book. Jurassic Park (1993) - When Bobbie Carter checks her English dictionary in the book, she discovers that 'raptor' means 'bird of prey'. During his Velociraptor speech at the start of the movie, Alan Grant tells the annoying kid: Well, maybe dinosaurs have more in common with present-day birds than they do with reptiles. Look at the pubic bone: turned backward, just like a bird. Look at the vertebrae: full of airsacs and hollows, just like a bird. And even the word 'raptor' means 'bird of prey'.